Counting - A simple to play activity that requires just a touch anywhere on the screen to continue the song. 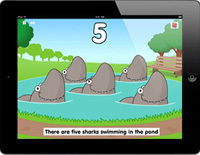 Ideal for young children and those requiring simple access or learning numbers 1 - 5. The song and animation stop at the end of the verse and a simple touch of the screen will continue the counting song. Encourages attention, listening and participation.